As you drive around, it’s common to see billboards everywhere. This form of advertising has become widespread. However, electronic message centers, the “new billboards,” are gaining traction in the competition for roadside eyeballs, with new features and possibilities. Here at SignCorp, our experienced and motivated team can help businesses leverage the power of outdoor electrical signage in Central Florida. 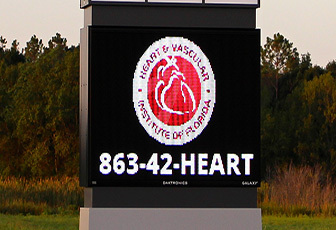 Electronic message centers are computerized and programmable so you can display different messages and images to potential customers as they drive by. Best of all, these signs are completely customizable, allowing you to choose how often you change your message. Showcased in bright LED lights, the message is clear any time of day. Plus, electronic message boards are designed to withstand damage from harsh weather conditions, including snow, rain and wind. Electronic message centers outdo their old-school counterparts in many ways, making them an asset to your business and its advertising strategy. Outdoor advertising has become popular mainly because drivers enjoy checking out the scenery while traveling. However, due to the overabundance of billboards across the landscape, these old-school signs no longer spark the same interest they once did. That’s why, at Sign Corp, we outdo other competitors by focusing on electronic message centers in Orlando to instantly grab a potential customer’s attention. The bright lights and changing graphics stand out among stagnant billboards. That’s because, unlike billboards, electronic message centers boast versatility and customization. An EMC allows you to introduce your business to everyone who sees it, draw them in with its changing messages and keep customers coming back for more with new and updated information. This impact doesn’t only occur in the daylight. With bright LED lights, your message will shine through 24 hours a day, ensuring that anyone who passes by will know about your business. Working with our dedicated SignCorp team, you determine the specific graphics, colors and text to be displayed on your EMC, allowing you to regularly, easily and instantly update your message to keep pace with consumers’ changing needs. You can even set times for specific messages to appear and the sign will do the rest of the work. The SignCorp team works with you like no other partner to ensure you have the options you need for your EMC to make the biggest impact. Our highly skilled team of marketing and design experts at SignCorp is the best choice to make the transition from billboard to electronic message center simple and effective. Our project managers will be by your side throughout the process of illustration, installation and maintenance to ensure that your business will reap the benefits for years to come. And, besides our commitment to the success of your business, SignCorp offers affordable pricing to make your dream of effective advertising through an electronic billboard attainable. Best of all, our team offers the option to lease your EMC. This stops your budget from getting in the way of turning your sign vision into a reality. Along with carefully creating eye-catching designs, meticulously building the sign with top-notch precision and accuracy and maintaining its appearance so its impact will not grow dim, the SignCorp team even takes care of your code research and permit acquisition. So, leave the nitty gritty to us as you focus on making a statement and turning heads with your new electronic billboard. We value our clients and work tirelessly to help you reach your goals through electrical signage. Our powerful team has the experience and creativity you need to take your business to the next level. To start, fill out our online form or call us at 863.268.2825 today!